The Anti-Nazi League (ANL) was an organisation set up in 1977 on the initiative of the Socialist Workers Party with sponsorship from some trade unions and the endorsement of a list of prominent people to oppose the rise of far-right groups in the United Kingdom. It was wound down in 1981. It was relaunched in 1992, but merged into Unite Against Fascism in 2003. Far-right politics in the United Kingdom have existed since at least the 1930s, with the formation of Nazi, fascist and anti-semitic movements. It went on to acquire more explicitly racial connotations, being dominated in the 1960s and 1970s by self-proclaimed white nationalist organisations that oppose non-white and Muslim immigration, such as the National Front (NF), the British Movement (BM) and British National Party (BNP), or the British Union of Fascists (BUF). Since the 1980s, the term has mainly been used to describe those who express the wish to preserve what they perceive to be British culture, and those who campaign against the presence of non-indigenous ethnic minorities and what they perceive to be an excessive number of asylum seekers. Unite Against Fascism (UAF) is an anti-fascist pressure group in the United Kingdom, with support from politicians of the three largest political parties in the House of Commons, including the former Conservative Prime Minister David Cameron and, when he was still alive, Labour politician Tony Benn. It describes itself as a national campaign with the aim of alerting British society to a perceived threat of fascism and the far right—in particular the British National Party (BNP)—gaining a foothold at local, national and European elections, arguing that "there is a real danger that the BNP could get a significant platform in elected institutions". In its first period, 1977–1982, the Anti-Nazi League was launched directly by the SWP; it was effectively its front organisation. Many trade unions sponsored it, as did the Indian Workers Association (then a large organisation), and many members of the Labour Party, including MPs such as Neil Kinnock. [ citation needed ] According to socialist historian Dave Renton, the ANL was "an orthodox united front" based on a "strategy of working class unity", as advocated by Leon Trotsky. Critics of the ANL, such as Anti-Fascist Action  argue that the ANL's co-operation with "bourgeois" groups who work closely with the state, such as Searchlight magazine and the Labour Party, rule out this description, making it a classic popular front. Neil Gordon Kinnock, Baron Kinnock, is a Welsh Labour Party politician. He served as a Member of Parliament from 1970 until 1995, first for Bedwellty and then for Islwyn. He was the Leader of the Labour Party and Leader of the Opposition from 1983 until 1992. Most of the ANL's leafleting and other campaigns in the 1970s were in opposition to far right groups which it claimed were not just racist but fascist, such as the National Front, an organisation led by John Tyndall who had a long history of involvement with openly fascist and Nazi groups. The ANL also campaigned against the British Movement which was a more openly Hitlerite grouping. John Hutchyns Tyndall was a British fascist political activist. A leading member of various small neo-Nazi groups during the late 1950s and 1960s, he was chairman of the National Front from 1972 to 1974 and again from 1975 to 1980, and then chairman of the British National Party from 1982 to 1999. He unsuccessfully stood for election to the House of Commons and European Parliament on several occasions. The British Movement (BM), later called the British National Socialist Movement (BNSM), is a British Neo-Nazi organisation founded by Colin Jordan in 1968. It grew out of the National Socialist Movement (NSM), which was founded in 1962. Frequently on the margins of the British far-right, the BM has had a long and chequered history for its association with violence and extremism. It was founded as a political party but manifested itself more as a pressure and activist group. It has had spells of dormancy. 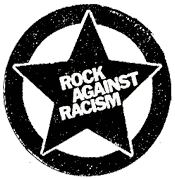 Rock Against Racism (RAR), a political and cultural movement, emerged in 1976 in reaction to a rise in racist attacks on the streets of the United Kingdom, and increasing support for the neo-Nazi National Front at the ballot box. Between 1976 and 1982 RAR activists organised national Carnivals and tours, as well as local gigs and clubs throughout the country. RAR brought together black and white fans in their common love of music, in order to discourage young people from embracing racism.The musicians came from all pop music genres, something reflected in one of RAR's slogans: "Reggae, soul, rock'n'roll, jazz, funk and punk". The movement was founded, in part, as a response to racist statements by well-known rock musicians. The Clash were an English rock band formed in London in 1976 as a key player in the original wave of British punk rock. They have also contributed to the post-punk and new wave movements that emerged in the wake of punk and employed elements of a variety of genres including reggae, dub, funk, ska and rockabilly. 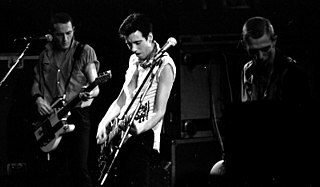 For most of their recording career, the Clash consisted of lead vocalist and rhythm guitarist Joe Strummer, lead guitarist and lead vocalist Mick Jones, bassist Paul Simonon, and drummer Nicky "Topper" Headon. Headon left the group in 1982, and internal friction led to Jones' departure the following year. The group continued with new members, but finally disbanded in early 1986. Stiff Little Fingers are a punk rock band from Belfast, Northern Ireland. They formed in 1977, at the height of the Troubles. They started out as a schoolboy band called Highway Star, doing rock covers, until they discovered punk. They split up after six years and four albums, although they reformed five years later, in 1987. Despite major personnel changes, they are still touring and recording. In 2014 the band released their tenth studio album and a world tour followed its release. Jake Burns, their lead singer, is the only member to have been with the band during all its incarnations, but in March 2006, original bass guitarist Ali McMordie rejoined them following the departure of The Jam bass player Bruce Foxton after fifteen years. Squadism was the practice of physical, anti-fascist direct action. The term, often used pejoratively by liberal anti-fascists eschewing violence, originated in the Anti-Nazi League, an anti-fascist campaigning organisation dominated by the heterodox Trotskyist Socialist Workers Party (SWP). The SWP formed "squads", fighting units, in 1977, initially to defend and steward meetings against violent attacks from the fascist National Front. However, other anti-fascist squads emerged separately from the SWP, such as the Sari Squad. Clement Blair Peach was a New Zealand-born teacher who died after an anti-racism demonstration in Southall, Middlesex, England. A campaigner and activist against the far right, in April 1979 Peach took part in an Anti-Nazi League demonstration in Southall against a National Front election meeting in the town hall and was hit on the head, probably by a member of the Special Patrol Group, a specialist unit within the Metropolitan Police Service. He died in hospital that night. The Special Patrol Group (SPG) was a unit of Greater London's Metropolitan Police Service, responsible for providing a centrally-based mobile capability for combating serious public disorder and crime that could not be dealt with by local divisions. The British National Party (BNP) is a far-right, fascist political party in the United Kingdom. It is headquartered in Wigton, Cumbria, and its current leader is Adam Walker. A minor party, it has no elected representatives at any level of UK government. Founded in 1982, the party reached its greatest level of success in the 2000s, when it had over fifty seats in local government, one seat on the London Assembly, and two Members of the European Parliament. Searchlight is a British magazine, founded in 1975 by Gerry Gable, which publishes exposés about racism, antisemitism and fascism in the United Kingdom and elsewhere. Column 88 was a neo-nazi paramilitary organisation based in the United Kingdom. It was formed in the early 1970s, and disbanded in the early 1980s. The members of Column 88 undertook military training under the supervision of a former Royal Marine Commando, and also held regular gatherings attended by neo-nazis from all over Europe. The name is code: the eighth letter of the alphabet 'HH' represents the Nazi greeting 'Heil Hitler'. Journalist Martin Walker described Column 88 as a "shadow paramilitary Nazi group". Martin Guy Alan Webster is a British political activist, a former leading figure on the far-right in the United Kingdom. An early member of the National Labour Party, he was John Tyndall's closest ally, and followed him in joining the original British National Party, the National Socialist Movement and the Greater Britain Movement. Webster also spent time in prison for helping to organise a paramilitary organisation, Spearhead, and was convicted under the Public Order Act 1936. Rumours of his homosexuality led to him becoming vilified in far-right circles, and he quietly disappeared from the political scene. Love Music Hate Racism (LMHR) is a music-oriented antiracism campaign based in Britain. The campaign aims to bring people together and promote unity through the power of music. LMHR was born in the tradition of the Rock Against Racism (RAR) movement of the late 1970s. The campaign held many successful festivals in the early 2000s such as a Victoria Park carnival and at Stoke Britannia Stadium, at which tens of thousands of people attended and international artists performed. The National Assembly Against Racism (NAAR) was a British anti-racist and anti-fascist group. Anti-Fascist Action (AFA) was a militant anti-fascist organisation, founded in the UK in 1985 by a wide range of anti-racist and anti-fascist organisations. The Battle of Lewisham took place on 13 August 1977, when 500 members of the far-right National Front (NF) attempted to march from New Cross to Lewisham in southeast London and various counter-demonstrations by approximately 4,000 people led to violent clashes between the two groups and between the anti-NF demonstrators and police. 5,000 police officers were present and 56 officers were injured, 11 of whom were hospitalised. 214 people were arrested. Later disturbances in Lewisham town centre saw the first use of police riot shields on the UK mainland. Redwatch is a British website associated with members of the far-right British People's Party. It publishes photographs of, and personal information about, alleged far left and anti-fascist activists. It typically targets activists in political parties, advocacy groups, trade unions and the media. The website's slogan is "Remember places, traitors' faces, they'll all pay for their crimes", a quote from neo-Nazi musician Ian Stuart Donaldson. David (Dave) Renton is a British barrister, historian and author. He was a long term member of the Socialist Workers Party (SWP) and has written a number of books including Fascism, Anti-Fascism and the 1940s. Youth against Racism in Europe (YRE) is an anti-racist organisation founded by the Committee for a Workers' International it campaigns among young people in 16 countries in Europe. YRE was launched by an international demonstration of 40,000 people against racism, in Brussels in October 1992. The Socialist Workers Party (SWP) is a far-left political party in the United Kingdom. Founded as the Socialist Review Group by supporters of Tony Cliff in 1950, it became the International Socialists in 1962 and the SWP in 1977. The party considers itself to be Trotskyist. Cliff and his followers criticised the Soviet Union and its satellites, calling them state capitalist rather than socialist countries. The Anti-Racist Alliance (ARA) was a UK-based anti-racist organisation formed in November 1991. It was formed mainly by black activists in the Labour Party (UK). On 16 October 1993, an anti-racism march near Welling in South East London turned violent, leading to large-scale clashes between police and protesters which left around 70 people injured. The march was intending to demand the closure of a bookshop which was the headquarters of the British National Party (BNP). The existence of an "avowedly racialist nationalist party" was a provocation both to the political left and the "whole range of established political opinion", with the NF's opponents perceiving it as "a loathsome graveyard echo of the old Nazism". The NF's rise in 1973–74 was noticed by the leaders of major social and political groups but they generally ignored it, hoping that depriving it of additional publicity would hasten its decline. ↑ Boothroyd, David (2001). The History of British Political Parties. Politico's. p. 303. ISBN 1-902301-59-5. ↑ Renton, Dave (25 December 1998). Fascism: Theory and Practice. Pluto Press. ISBN 0-7453-1470-8. 1 2 "Love Music Hate Racism". Love Music Hate Racism. Retrieved 26 July 2014. 1 2 Steve Tilzey and Dave Hann No Retreat London: Milo Books, 2003; Sean Birchall Beating the Fascists' London: Freedom Press, 2010. ↑ "BBC 1979: "Teacher dies in Southall race riots"". BBC News. 23 April 1979. Retrieved 1 January 2010. ↑ "Blair Peach Primary School". ↑ Sandra Laville and Matthew Taylor, "A racist, violent neo-nazi to the end: BNP founder Tyndall dies", The Guardian , 20 July 2005. ↑ Cobain, Ian (22 December 2006). "The Guardian: "Racism, recruitment and how the BNP believes it is just 'one crisis away from power'"". London. Retrieved 26 March 2010. ↑ Tate, David (24 May 2006). "The Guardian: "Unite against Facism: let's hope so"". London. Retrieved 25 April 2010. ↑ "Socialism Today: "The politics of anti-fascism"". ↑ Sabbagh, Dan (7 August 2018). "John McDonnell: revive Anti-Nazi League to oppose far right". The Guardian. Retrieved 20 August 2018. 1 2 Sabbagh, Dan (15 August 2018). "Anti-Nazi League founders call for new national campaign". The Guardian. Retrieved 20 August 2018. The Guardian "BNP in turmoil as members row about 'ethnic' candidate"
When We Touched The Sky: The Anti-Nazi League in Britain 1977–1981 by Dave Renton – former Socialist Workers' Party and Anti-Nazi League member chronicles the history of the ANL in this May 2006 book. Anti-Nazi League founders call for new national campaign.